Rated 3 out of 5 by Godlover24 from could have been better Based on a full finished game review: Well, I finished the game in no less than 2 hours. It could have been better, and I felt the game was too short. Beautiful graphics and good storyline. Plus I felt that it was not challenging enough for me. Disappointed especially because I was looking forward to playing this game. I played all the other Redemption Cemetary games, and by far this is my least favorite. It is a good game, just not for me. Hopefully, you guys make another one! Thanks! Rated 3 out of 5 by theswede from death is only a journey this makes the 11th one in this series it was okay again I think all the developers need to come up with some fresh ideas !!!! Rated 3 out of 5 by pgillenw from A Bit Disappointed! I share the blame for my disappointment. I am so done with the storyline of soul collectors, seeking immortality and evil returning from the dead. Creative teams. time to be creative and not depend on an overused worn box. Sorry folks although the graphics cleverness was very good and the supporting programming just not enough to overcome the tired old story narrative. For some players what I have said will not be an issue so enjoy. Rated 3 out of 5 by judy76073 from Redemption Cemetary: Day of the Almost Dead CE - boring I was looking forward to a great CE game today - alas, I found this somewhat boring - too puzzle heavy for my liking. 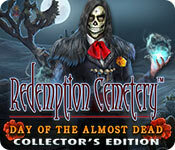 I have the other Redemption Cemetery games (which I enjoyed), not so with this one. Definitely, NOT enough extras to warrant being a CE game (even though the sale this weekend was fairly good. I played about 30 minutes of the demo - just was not interested enough to carry on. Sorry, Developers !! this just does not "cut the mustard" as a CE game. More and more I am finding that the game developers are putting less & less extra's into their games. Just not making their CE games worthy of being rated CE. C'mon Developers - get with the program here - us gamers would like to see some NEW series coming out - not a #12 or #15 of a series that's been out there for years. The extras have been getting less and less over time - you guys need to "kick it up a notch" !! Just my opinion. Sorry. I just found this game very disappointing. Rated 3 out of 5 by rainworm from Among the dead, the almost dead – is there anybody still alive? The Day of the Dead is very popular in certain parts of the world. On this holiday friends and family members of those who have died gather together to pray for them and bring to their graves the deceased’s favorite foods, often including the traditional “sugar skulls” and the “bread of death.” It has become a happy festival nowadays. But not here, on the day of the almost dead! Equipped better than in the early days of the series, when we got letters, we receive a mail on our tablet. Santa Muerte asks for help, as an evil spirit threatens to take over the land of the living and turn it into a land of the dead. Specialized in cases with ghosts, who cannot find their final rest, we leave for the place. Meeting the woman, we learn, it is Shibalba, who has to be defeated. He needs three more souls to win his battle, so we have to save those souls to ban the evil spirit. The the game is well made concerning visuals and effects, We use our smarphone as helpful tool, so a tribute to present times even in an old series. In the attempt to make the game more challenging, than usual, we have mini puzzes for almost every step. There is no opening of a chest or door without such obstacle. HOS are mainly lists, nothing special. As in all Redemption Cemetery games we have a story with 3 substories, here for each soul to be saved. Though relatively fast paced concerning the plot(s), I feel as if I visit a well known place: there are the souls, finding no rest, so I have to bring order in their former lives. An all time varied story, which surely has fans. Rated 2 out of 5 by codom from Just Plain Bored I made the mistake of buying this game without trialing it. Big mistake. This is the most boring game I've played in a long time. I thought Amax had finally turned the corner, but I was sadly mistaken. The graphics and challenge are ok, but what good is that if you bored stiff. I absolutely suggest trialing this before buying! Rated 2 out of 5 by steve_san from Day of Beating a Dead Horse It's Redemption Cemetery so of course we have spirits and such. But there is absolutely nothing new in the story. It's the usual "capture x number of souls to reincarnate some infernal being." By the way, I never knew a soul looked like a smoky vapor. And what do you capture a soul in anyway? In the opening scene, a young woman standing in the rain is absorbed by a cloud of black smoke. Desperately, her hand reaches out of the smoke to try to grasp... her umbrella? What was she going to do, beat the spirit to death with it? I knew we were in trouble at that moment. It didn't get much better as it was impossible to progress without solving an interminable number of puzzles and gathering a similar number of objects. One puzzle required you to direct water from point A to point B - except that I could never figure out what point B was, so I was never sure how to solve it (for me, a guaranteed deal breaker). The few HOPs that appeared were a nice relief from the tedium, but they were sadly unremarkable. There were not even many collectibles or other extras to make it more interesting, and I'm really not sure what, if any, was the theme for the collectibles (pyramid, elephant, ???). I did not find any morphing objects. Really a big all around disappointment for me. The story and game play were both a big letdown. I did not enjoy the trial and won't be purchasing. Better luck on the nexy Day. Rated 2 out of 5 by LunaNik from Cookie cutter gameplay set in a whitewashed storyline. I'm curious as to how this storyline was developed, because it seems that AMAX just mashed together a bunch of Central and South American cultures. Santa Muerte is a personification of death in Mexican Catholicism. Xibalba isn't an entity; it's the Mayan word for "underworld." And Kalaka isn't an entity in either belief system, but it is Arawak for "chicken." 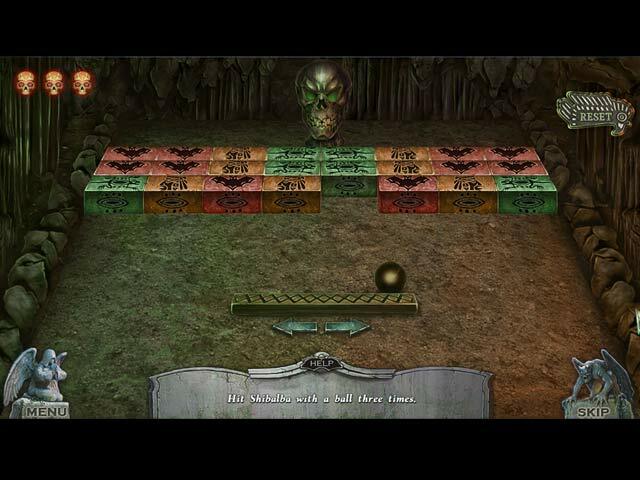 So, the plot is a poorly researched and badly executed "good versus evil" theme, which has been done to the death (pun intended) in the HOPA genre. Plan on finding and using at least five shaped keys per game scene, along with the usual laundry list of boring tasks. Santa Muerte provided us with a raven to acquire things out of reach…and her cell phone. It's not possible to suspend disbelief and remain immersed in a game that's so silly. I mean, a supernatural personification of death…with a cell phone? Give me a break. The HOs have varied presentations, but are too easy. Actually hiding the objects would have improved them. The mini-games are unimaginative and insipid: • There were three jigsaws, about one every ten minutes. • Match skulls to their silhouettes, then match keys to skulls. • Rock/Paper/Scissors with a skeletal hand (random guessing). • Arrange gems by color and number. Really? Who thought this was challenging? • Repair a doll by clicking the needle when it crosses the target zone, then dragging a skull along a line without touching the sides. • Light candles; lighting one affects others. • Choose symbols from the most simple to the most elaborate. • Move tokens to their goals; they move like chess knights. The CE bling is comprehensive. However, I was unable to acquire any of the collectibles, regardless of how many times I clicked on them. And the game crashed on me. Twice. The graphics and animation are okay, but not phenomenal, blending the darker colors of a cemetery at night with the brighter tones typically seen in Day of the Dead festivals. With only four soundtracks, the music became repetitive quickly. Lastly, and this may just be a pet peeve of mine, but the children were voiced by a adult in falsetto. CONCLUSION ?? Just another cookie cutter, I'm afraid. I'll pass. And why release a Day of the Dead game in August? I strongly suggest that AMAX end all its existing series and work on something new, preferably original and creative. Rated 2 out of 5 by dancemom1 from Very diappointing... Hello friends! As usual, I review mostly on the game play and not the story line. This addition has very nice graphics, clear and no blurring in close ups. Animation isn't bad, but they do need to blink now and then. The voices are very well done, with the bad guy having a very sinister voice. Others do show emotion and fear, etc. Colors were very bright and true, but not over powering at all. The sound FX were appropriate for what was happening at the time. The demo was so short, I didn't even notice the music. HOPs are nothing new, and items were not difficult to find. The highlighted word HOP was way too long and boring. I did not see that we could switch to something else when we got bored. Again, the puzzles were painfully simple and took no time or brain power to complete. Help system was no help at all. When I ask for a hint, I expect to see more than "done everything I can here," backed up to another area and got "I should look elsewhere," backed up again and got the same stuff. Okay, so where do I go now? I've clicked everywhere and tried using everything I have in my inventory...frustrating! Collectibles were very disappointing. Various collectible items. These are not difficult to find and vary in size and shape. Definitely needed something extra here. The story was slow and boring, nothing new. There is nothing more maddening than to have to choose dialog, and this one has it. Makes a game feel more like a comic book, rather than an action game. I've played many other games with the "day of the dead" storyline. They had great sound FX and music to tie it all together. This one didn't. There is no challenge to this game at all and the lack of nice collectibles makes it not CE worthy. The only positives I found are listed in the first paragraph. This game might appeal to a beginner, but probably not a seasoned gamer. I'm sure there will be those who really like this one. I will recommend this game for people who don't mind clicking on dialog or looking at the strategy guide to see where they need to go next. Nope, no buy for me. As always, try it for yourself and see what you think. We all have different tastes in games and you might find this one to be exactly what you are looking for. Thanks for the reviews. Play on! Rated 2 out of 5 by mmdgaston from boring.... this is one of the most boring games this year. and the last 3-4 in this mess of a series were all boring, too bad. too much back and forth....lots!!!! i could go into detailed accounts of this game..but i need a nap after playing this awful game...the graphics were wonderful...and thats about it. Rated 2 out of 5 by cathybobcat from ONE PUZZLE AFTER ANOTHER Is there supposed to be a story here? Let me tell you that there are MANY more puzzles in this than the indicated 18 that you can replay. It is so excessive. It was practically all I was doing....one right after another. I didn't finish the demo because of it. I do not care to be spending all of game time with puzzles. How about having one HOS after another for a change? It's too bad because the graphics in this are excellent and even though the story has been done before, I surely would have considered this otherwise. The over abundance of puzzles did it for me. Rated 1 out of 5 by tessalu from Same Old Same Old I was expecting so much more from this game and this developer. I was sadly disappointed. It was the same old evil spirits, lots of skeletons and skulls, trapped by the dead or not quite dead.....yawn. I wanted to see the bright colors of the Day of Dead festivities but what you get is the usual blacks, greys, and muted colors with a few splashes of red or orange thrown in. The mini-games were tedious and in some cases too nitpicky and the HOP weren't especially difficult or interesting. It looks like the developer put almost no effort into this at all. How sad.....they are capable of so much better. Color me not impressed and yes, DEAD bored. Rated 1 out of 5 by twinsoniclab from Horrendously Awful... Worst Game of this Year, or Longer! This is one terrible game! I had to force myself to finish just 28 minutes of the demo. I literally wanted to quit when I saw the home page (the spriit's phone message of "SAVE US!" was just too hokey!) where you choose to "play!" I recommend you not get past even that. The graphics are outrageously bad. The one HOS (other than an 8 part mini) in the 28 minutes had the worst graphics I've seen in a long, long time. Actually, ever. To get the HOS review over and done with, it was to find the words highlighted in a sentence, as Santa Muerte (a folk saint) tells us a story. Very few items. These story HOS take longer as we wait for the story to unfold, but they contain less game play. We've got poorly rendered floating "ghosts" or "souls" as well. I'd be embarrassed to release a game with such poor graphics. 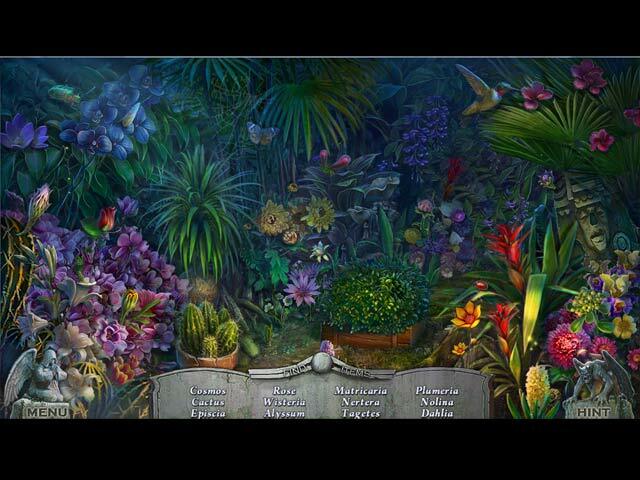 PUZZLES: As with most Hidden Object/Puzzles games of late, many more puzzles than HOS. Fine, I like puzzles, just not these! * move 4 skulls to match their insets (if you are stuck, you saw a picture of it earlier) * put keys in proper skull mouths (4) * play rock-paper-scissors with a skeleton arm, once, and not really, just choose the silhouetted choices on the box. Could have been fun, if don't differently, and more than once. * move gems to match key colors, and according to their numbers, which are 1-4 * swap 8 pieces to form a button * ooooo.... "sew" on the button by clicking when the moving needle is in the green zone! Then repair a tear by dragging a token along a zigzag, with just 3 moves. * Then take that item you just repaired, add it to the 3 missing candles you've found, and light all the candles, where lighting one may put the others out. When done with that the little girl soul tells you, "I can't bear the suffering!" I guess we are supposed to be horrified and play to help her. * restore a portal by dragging rows and columns We rescue Santa Muerte after she falls into an open grave and gets buried under large boulders and rubble. But, she's fine, since she's a saint, not human. Though she does use a smart phone, and send videos! She informs us, "My dream showed me that only you can save us!" Talk about pressure... Some gripes: * if the game is set on the Day of the Dead, whey didn't this game get released at the end of October to play at the correct time of year? * if the developers want to incorporate actual characters from folklore, get their names right! KALAKA is an ancient Indian mythological figure. CALACA is the skeleton or skull used in decoration for Day of the Dead! SHILALBA is actually XIBALBA, the underworld in Mayan myth. Oh, we get a helper raven. There's the portal. We collect stuff related to, um... I guess ancient civilizations? One seems to be a step pyramid. Maybe the developers are trying to cash in on the Coco (Pixar movie) craze, but this is just a poor game all around. So, I can't be recommending it! 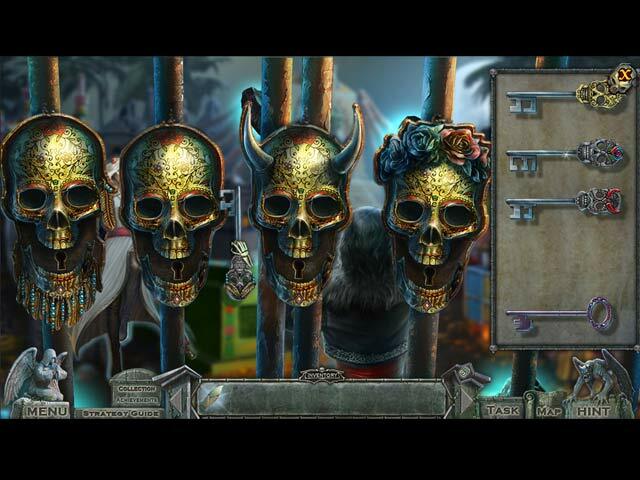 Rated 1 out of 5 by 1RedZ from NOT a Hidden Object game Based on the Trial. This is NOT a Hidden Object game, it a Puzzle game. I've loved this series since the beginning, and have all but one of the games in this series. I will most definitely NOT be buying this game, as I don't like Puzzles, and that's pretty much all there are in this game. I was so pleased to see another addition to this wonderful series but what a disappointment this turned out to be. If you're looking for a Puzzle-fest, you'll love this game. If like me you're looking for a Hidden Object game, look elsewhere.